Preparing for Amelie’s birthday celebrations! 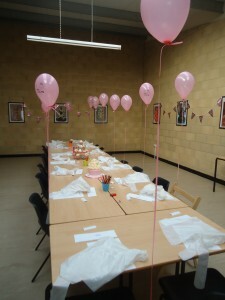 Last weekend we had a lovely group of girls join us at studio E for what was to be Amelie’s birthday party. Amelie was a keen young baker that couldn’t wait to make a mess, and hopefully some cupcakes in the kitchen! Bee, our highly qualified pastry chef, was on hand to greet the children and get them all kitted out with their snazzy aprons. Once the aprons were tied and the cooking utensils were out Bee gave the girls a quick demonstration on how to whisk up some buttercream and bake a batch of cupcakes. We then swiftly got moving onto the best bit; handing the wooden spoon over to the children so they could get decorating their very own batch of four cupcakes with lashings of butter cream, sugar decorations and sprinkles of sparkle. Amelie and the girls didn’t hold back, smothering their fluffy cupcakes with lots of buttercream and tons of decorations, all of course with the guidance of Bee to help them along the way. Once the cupcakes were personalised Bee and the girls headed upstairs for some refreshments and also tucked into some of thier freshly baked cupcake, a very well-earned reward! The rest were then packaged up ready for each of the girls to take home their treats for the whole family to enjoy. “I just wanted to say a quick thank you for Saturday. All the girls, especially Amelie, had a great time. You looked after us all very well and managed to keep everyone under control! If you’re struggling to find the perfect party for your little one then let us take the stress away by offering a fun-filled, hands on hour and a half cupcake demonstration. Priced at £12.50 per child with refreshments served during the party it’s a fabulous way to celebrate your child’s birthday leaving a sweet taste in your mouth.